We feature active, biogenic, paraben-free and preservative-free ingredients in highly concentrated amounts that stimulate and nourish skin tissue. The end result is healthy, beautiful skin. Do you want to use the most luxurious, beneficial, nutrient dense cosmetics available on the market today? Skin nurturing mineral makeup for beauty with a higher purpose.Advanced formulations combine pharmaceutical-grade ingredients, natural high-pigment minerals and the power of antioxidants. The result is clinically advanced makeup that covers and helps correct and protect. 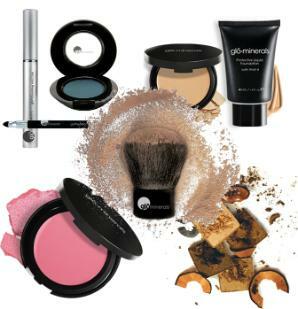 gloMinerals cosmetics deliver unsurpassed coverage, broad spectrum UV protection and helps combat free radical damage. This clinical mineral makeup line is preferred by dermatologists and leading skincare professionals worldwide. Perfect skin isn't a matter of luck, it's a matter of science. glominerals makes science beautiful.